“Extra” special correspondent Hilaria Baldwin hung out with Kelly Clarkson at our H&M studios in NYC’s Times Square, where she revealed she is working on a new album! Though Kelly has a powerhouse voice that has won her three Grammys, River is not all that impressed. Kelly shared, “She will be like, ‘Sing this, sing that!’ and then literally, mid-song, while I’m putting her to bed, will put her hand on my face and go, ‘Bye'… I’m like, “Wait! People pay for this.’"
Kelly’s new book is in stores now. 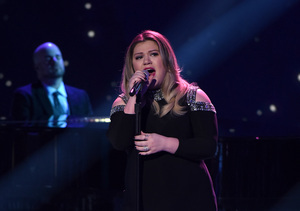 Kelly Clarkson Welcomes Baby Boy — What’s His Name?